This concert was the second gig I went to on this KP tour de UK. The day before I went to Brighton to catch an excellent Alice Cooper concert and the day after I saw an awesome Jason Ringenberg (of the Scorchers) gig at Borderline in London. I headed for Camden and tried to locate a t-shirt shop but only located a pool of dirty water I stepped into. I went back to The World's End and discovered that I was the only (visible) Sputnik fan in there. I listened to an Irish Folk Band (quite good actually) and conducted a few experiments to see the effects of tipping well. Let me tell you, it actually works. No tip = no service. Tip well = they'll ignore everyone but you. Anyway, time to go to the gig I thought. At The Underworld I met a ton of Sputnik fans. Some of them were: Sputnikfred, Jill, Lynn, Jason, Zammo, Lloyd, Tapio, Dodger. Shoot me for forgetting the rest of your names! There were however no: DocSputnik, Annie or Rachel. Ah well, hopefully next time! :) We had a lot of drinks (I'm sure I had, at least) and managed to skip most of the support bands. 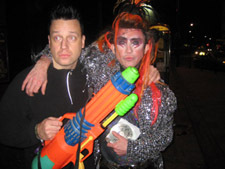 I bought the cd version of "Sputnik vs. Bowie, Part 1" and had it autographed by Degz later on. I even was in charge of the merchandize stand for a few minutes, but I didn't sell anything. Sputnik Electronic is a 2 piece band with Martin Degville on vocals and his buddy Johann Weidemann taking care of the keys. 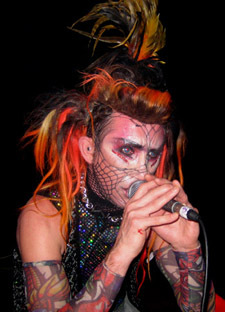 The setlist was mainly re-recorded Sigue Sigue Sputnik material with a single Bowie song in between. The new versions of the songs sound really great and a lot of the credit goes to Lloyd Price for that, since he has done the programming. Superb job, mate! The crowd was just as electric as the band was electronic and we had a great time singing along to all the old favourites. A lot of smoke was used during the set and it made it a little difficult to shoot good photos, but not entirely impossible. At some point dancer Collagen Westwood also joined the two guys up on stage. If anyone (me, perhaps) had feared how a fully electronic Sputnik gig would work, then I can assure you that it works alright. I will prefer a full live band any day because I want live gigs to be live with all the possible problems and charm it may include. But for smaller venues I can easily see why it makes very much sense to use a setup like this. And with the new versions of the old songs it really sounds great, and Degville has enough charisma to drive a show pretty much by just being there. Not that it would ever be enough for him. He surely rocked it like he always does! I do hope that this new Sputnik Electronic line up doesn't mean that the Sputnik2 songs have been totally forgotten about. I still think that "Prophet of Freak" is an awesome album. After the encore the band did a final spin of "Rockit Miss U.S.A." and then the show ended. Martin and Johann joined us in the bar for photo shoots and autographs for a few minutes until the usual Underworld policy kicked in and a rude bouncer came to throw everyone including the band out. We went outside and I had some sort of dead rat pizza and then a bit later Martin came out and joined us for some more photos and a chat. After that I headed for the closed Mornington Crescent tube station and found a mini cab to take me back to my stinky hotel room where I had to sleep with an open window. Rather cold air than air mixed with rottening cat I figured.